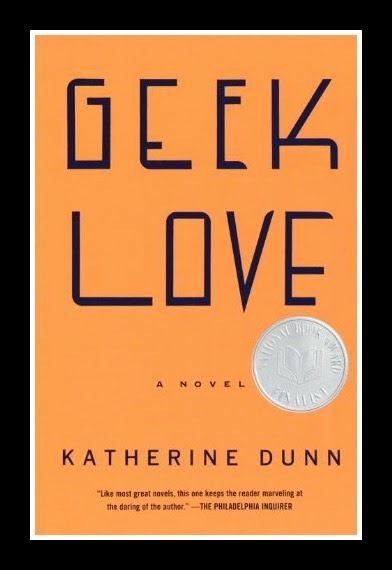 This month's selection was Geek Love by Katherine Dunn, and boy was it a great read! 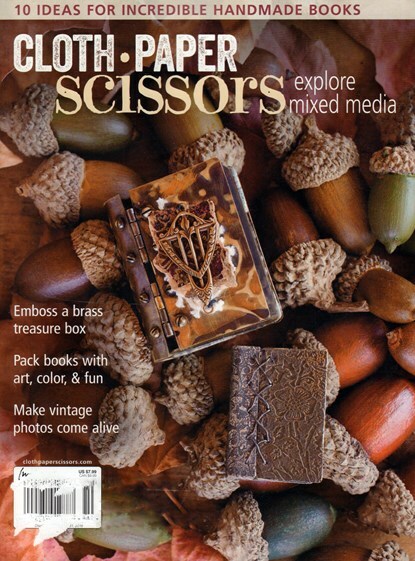 I only post this cover because there are several ones out there, and let me say, it does make a difference as to orientation. Let me explain. Normally when I start a book I usually don't read the back covers or synopsis so as not to be biased. But girl, let me tell you, I DO judge a cover! And there will be no apologies here for that! So when I picked this one up, I was thinking that this was going to be some hot and steamy, 50 shades of Geek Squad, (as in Best Buy techie help) trash novel. Yeah...NOT! I had to literally read the first page five times because I was soooo confused! Finally, I had to break my own rule and read the back cover just so it made sense! Did you know that a Geek is not someone who routinely helps computer illiterate 40 somethings (and I'm referring to personal experience here) with their (so simple that a five year old could operate it) gadgets, but is actually the title given to someone who bites the heads off of live chickens? LIVE CHICKENS! And let me tell you, this is only the beginning of this crazy, wonderful read! At times I found myself saying "Oh no they aren't.." only to be followed by "OMG they did"! It has been a long time since I have read something this imaginative with such great character development. And yet at the same time, if you grew up in the evangelical South like I did, it is still very believable. During the summer months growing up I can remember seeing the revival tents springing up and thinking that the circus was in town! Same type of big tents, same time of year, same large crowds, and usually the smell of BBQ at both places. See how confusing this might be to a child? Hell, it's still confusing as an adult! Although I can say now that it's usually the age of the crowd that helps you decide which is which. And have you ever been too polite to say no and had to make good on your promise to attend your boss's/coworker/rotary club member/spouse's boss/friend's church service on the first Sunday of the month? Well, let me tell you, that in itself is a circus midway game! Step right up ladies! Roll the dice! Say "no thanks" to that invitation and you will either be a social pariah or treated to a wonderfully exciting snake handling service! Now which will it be? Make sure you blow on the dice for good luck before you roll! And have you ever attended said rural church service only to be lulled into thinking it was going to be just your average "go out into the world and do good" service by the nice welcoming congregation? Only to be fooled once the doors shut for the service to begin, by a whole other congregation leaping into action? Then you look over to your spouse, who is also trying to fake smile their way out of terror, to see if they have counted the pews to the nearest exit. And then you turn to your "friend" that invited you there in the first place, and look her right in the eye and give her that "thank you for inviting me" polite smile, and at the same time you think REALLY LOUDLY "if there are going to be snakes involved and you knew that, and if you failed to tell me such snakes would be involved because you knew I'd politely decline your invitation, well, there are going to be problems between us right after this service!" But then three hours into said service, you are like "bring out the snakes!" because at this point you are just waiting to see if anybody gets bitten and how the congregation will react. You want to see a SHOW! You want to see a test of faith in ACTION! You want a ticket to that CIRCUS! Well go read Geek Love, because it is all that and a few more layers too. 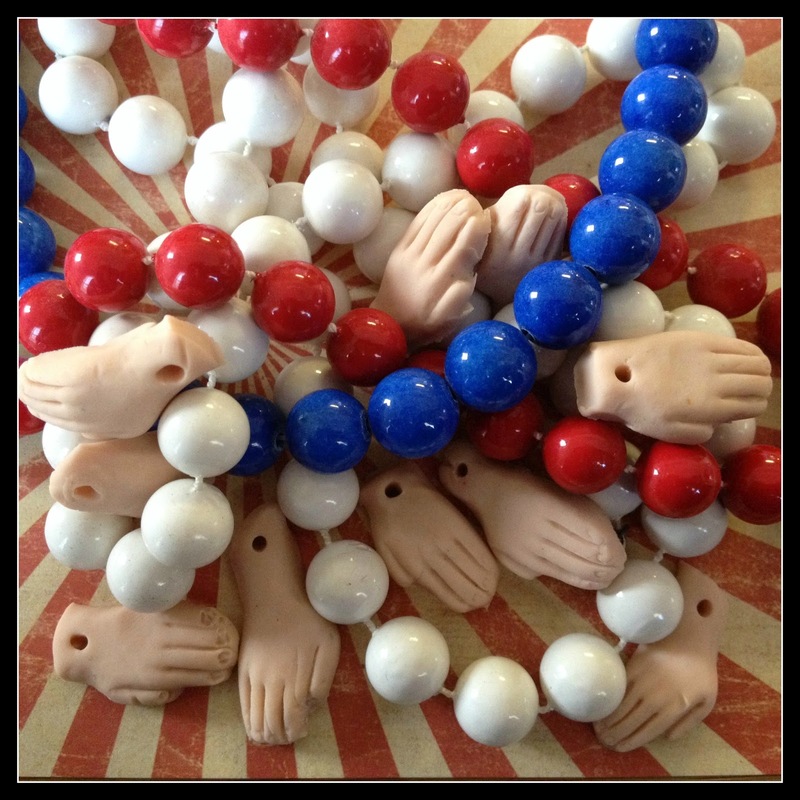 I started to make a charm bracelet with some beads and polymer clay severed hands, but when I started my design all the red, white and blue beads, together with the hands, spoke more of Americana applause then the more sinister effect I was going for, so I stopped and just took a picture instead. The next piece I created was in homage to Arturo and is a polymer clay torso that is painted with acrylics and inked as well. I chose the green and black colors to symbolize the gangrene that had to have been present in some followers! I added the yellow sari ribbon because it reminded me of the bandages of those patients. Can you image the smell of that midway? The hand tattoo was added to symbolize the stages of faith-starting with the digits and ending with just a torso. And just to follow up on the symbolism, I put the piece on an actual cutting board to shoot it. And then I decided to create a resin pendant to showcase the whole book. The back image is a ticket to a circus, complete with a freak show advertisement! I hope you will join this incredible group! You can find all the other participants HERE! Until Next Time....be the star in your circus! HALLELUJAH! I can hear the congregation now! Your post was so fun to read! Your necklaces are amazing and really brought out the carnival feel! What a wacky book this was, everyone had so much fun with it,too! Sat here chuckling while I read your post. Like both of your pieces, especially the circus feel of the resin piece. 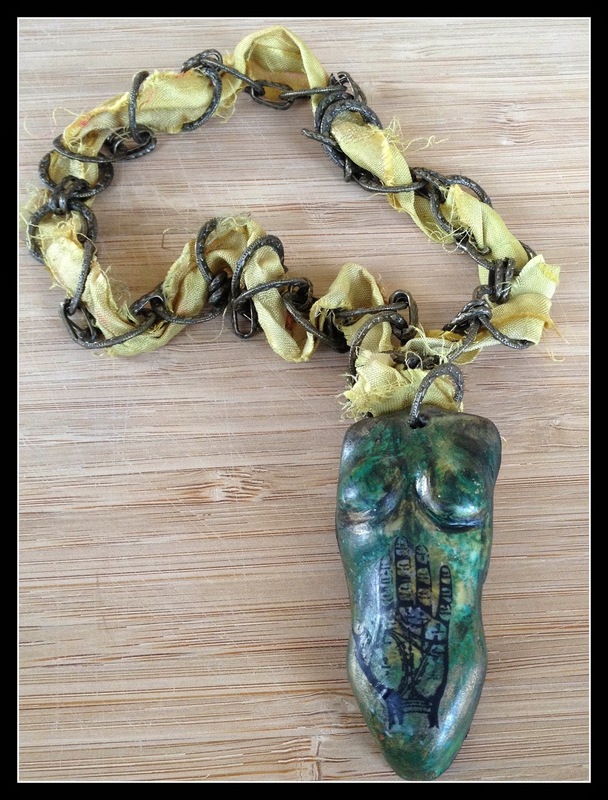 These pieces are amazing and since it's dinner time I won't talk about gangrene, snake bites and such, but wanted to let you know what a fabulous jewelry artist you are!!! I remember getting some of those invitations and the awkwardness that proceeded. I remember a particularly hot day in rural Florida, the preacher was doing his best fire and brimstone sermon, and he started bleeding from his ears and it mixed with his sweat and was staining his white, almost see-through, shirt. Anyways... what a dozy indeed! I'm not easily shocked, but there were definitely moments that caught me off guard. The pieces that you created are wonderful! I love how whimsical they are and they capture the book so perfectly! 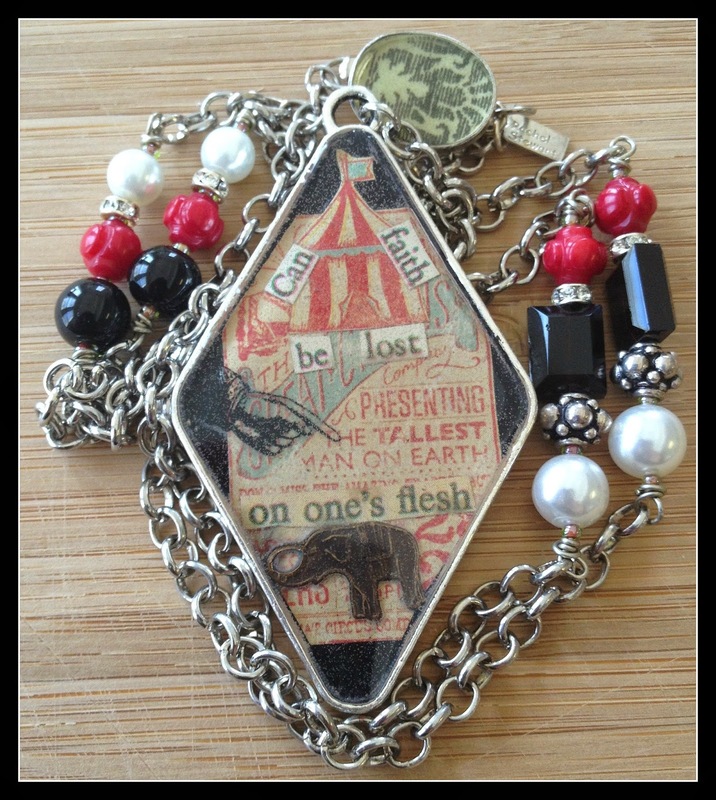 The collage pendant is lovely and has that vintage feel. Great job! And thank you so much for participating! OMG, your post made me laugh so hard! I grew up in the South so I so GET what you are talking about... although, thankfully, the Souther Baptists weren't so much about the snakes. :) I love that collage pendant so much!! (Out of curiosity, what sort of resin do you use?) I have to say your Arty piece is deliciously creepy too. Great work as always! The severed hands would have been fabulous. Wherever did you find them? The torso - a little creepy, considering the context, but great. And the necklace definitely evokes the feeling of the book. so glad you participated. I loved this book too! Over the years I have recommended it to many friends but I guess the cover turned them off. Ha! Great review. 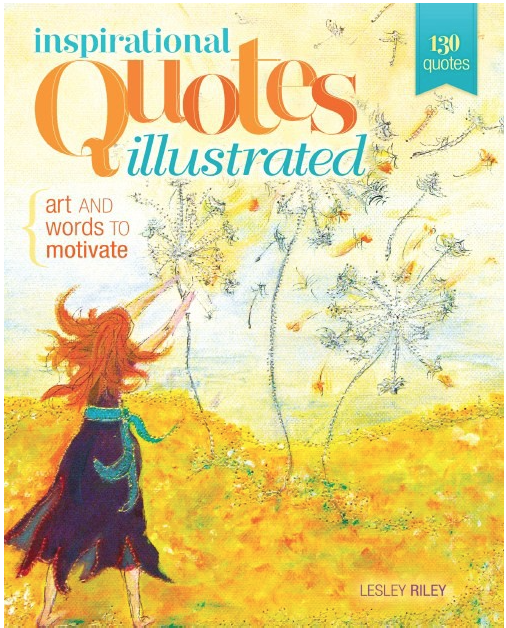 Happy I found your creative blog!